Bolt Storm is the project I'm currently part of as Gameplay Programmer, during my 3rd year at NHTV University. The project has around 25 team members, 12 of which are programmers. I joined the project when it transitioned from pre-production to production. I developed a finite state machine which can be applied to any character (player, co-op players, AI) to support the rewrite of character logic at the start of the production phase. 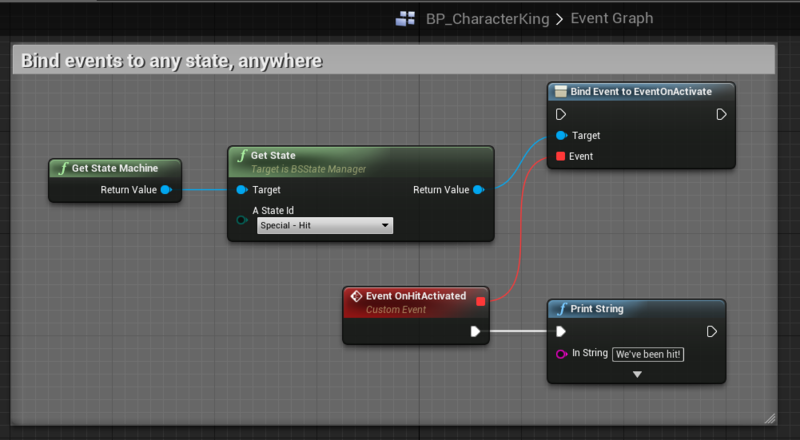 The state machine is quite simplistic, it features an ordered list of states, with the first few slots reserved for 'primary' states (walking, strafing, etc. - states which affect the lower body of the player) and 'secondary' states (shooting, aiming, etc. - states which affect the upper body). The state machine is written in C++, but is entirely accessible from Blueprints. * and eventually deactivates it, if the state is still active. ** The following Set and Unset functions DO NOT actually modify mActiveStatesArray. ** They ONLY set a set / unset flag within the state, which are checked the next frame. ** The 'Now' functions are exposed to C++ users, but not to Blueprints. * Sets the state with aStateId as active. * state contained in the slot is automatically deactivated. * In case of a 'special' state, it is added to the bottom of the list. * Use UnsetState() to deactivate any state, including special states. * Deactivates the state with aStateId. 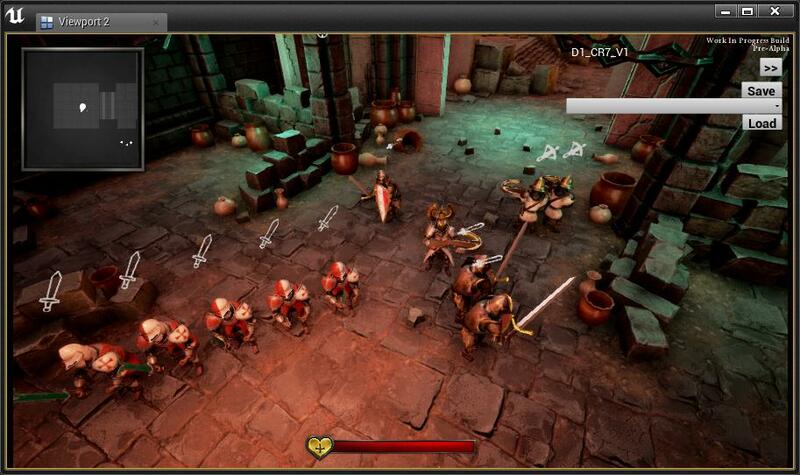 Bolt Storm features both ranged (gun, crossbow) and melee (sword, knife) combat. To allow for these different types of weapons, I set up a system which can map bones ('sockets') of characters to a specific slot, so that weapons can be used on different skeletons. The slot definitions, weapons themselves, and even the local binding have local offsets, to fine-tune the position in every case. 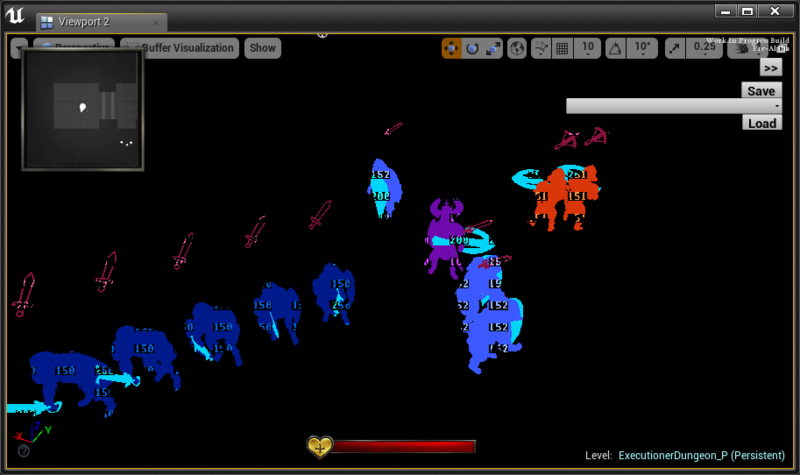 Swords swing pretty fast, meaning the default collision checking wasn't optimal in our case. We also wanted collision checking 'LODs', in other words; being able to have less precise collision checking in cases where precision doesn't really matter. 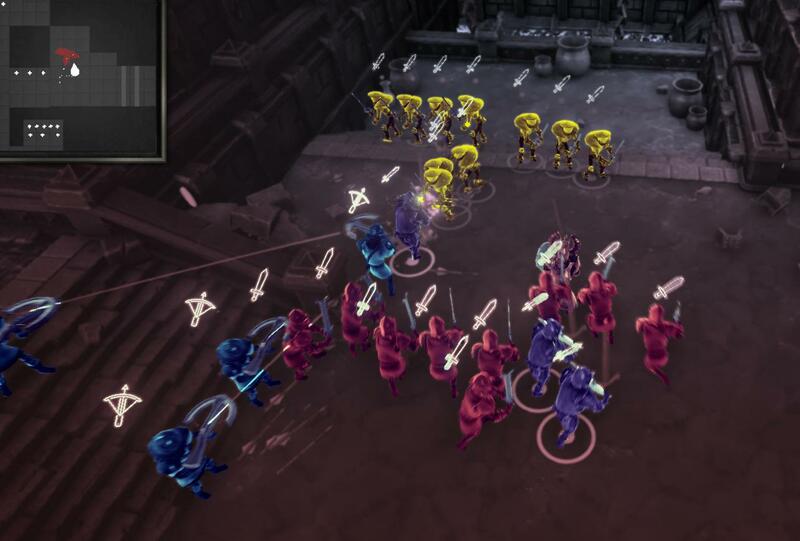 In the case of Bolt Storm, there can be armies of knights fighting, so collision hits can be guessed, instead of checked very precisely. For 1-on-1 combat, I implemented collision checking by having a set of boxes on the weapon which define what is collidable, then each frame the previous position of each box is traced against the current position of that box. 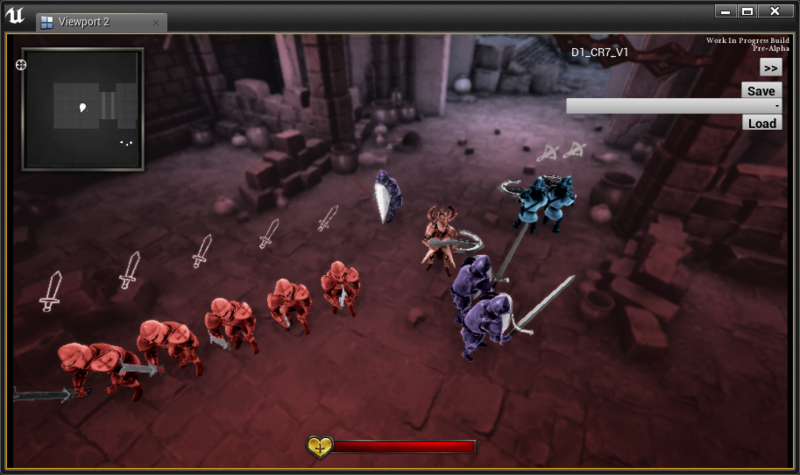 The following demonstrates the character logic and the combat system in action, notice how the character rotation locks while he swings the sword, and waits until the attack is over before rotating back. For both controller and mouse/keyboard controls I implemented a system that auto-aims to objects based on a variety of factors (fixed per-object priority, angle to weapon, distance, etc.). I designed and developed some UI elements for Bolt Storm, for example, a widget that slides open to reveal information about an item that you can buy (swords, crossbows, etc). It compares your currently-equipped item with the one you're able to buy. In Bolt Storm you can command your army to attack a certain group of enemies. 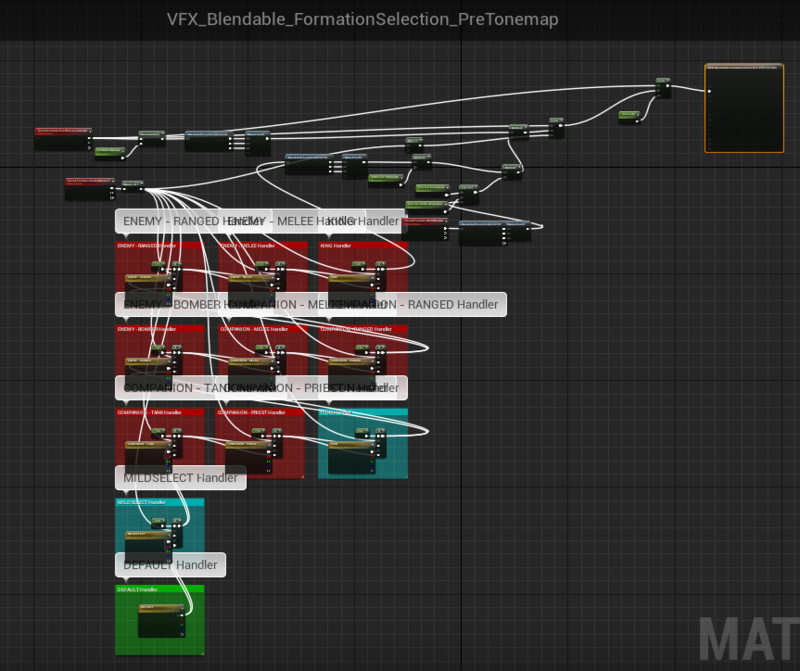 I wrote a shader consisting of two passes (a pre-tonemap and post-tonemap pass) to visualize the selection. Note: this is still a work in progress! At the moment, the stencil values are a hardcoded "enum" value, but this will most likely change to a bit mask. (The screenshot above is without the pre-tonemap shader applied). At the moment the shaders identify the objects by a number of if-statements, this will soon be optimized by making the stencil values a bitmask.